In our parts of the world rainfall and access to water is often taken for granted, but when it fails, we need to rethink our water management. 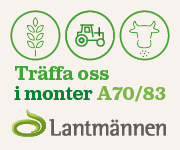 Water issues in agriculture are highlighted in many ways during the 2019 years edition of Borgeby Fältdagar, and one of the most visual enhancements is the new machine demonstration - irrigation! During the demonstration that runs live, the potential of irrigation is lifted both from a biological and a technical perspective. BAUER sets up their center pivot. Rosenqvist Irrigation participates with a ramp machine with hybrid ramp that can spread up to 72m. They also show a Zimmatic pivot facility. Östorp's bevattning shows its Fasterholt machine that differs from conventional hose machines. Viby teknik presents Othec pivot system. Viby teknik also has conventional hose spreaders along. “Water is a necessary resource in agriculture and in order to utilize it in a responsible manner, well thought-out strategies and good technology are a prerequisite," says Ida Lindell, productionadvisor at HIR Skåne and responsible by the microphone during machine demonstrations. The right amount of water must be in the right place at the right time and to succeed it requires good knowledge of soil conditions and the needs of the crop. The technology is a necessary tool to make the best use of the production potential that exists at the site, concludes Ida. The machines will be run live one by one and commented on by both HIR Skåne's advisors and the company representatives themselves.